Hello. as my first project in my 87 911 I'm going to replace the alternator/regulator. I''ve read many of the tech write ups and it doesn't look too bad. I say that now but truth be told I am a bit nervous about it. Anyway, I'm looking for a good shop in the Cincinnati area to do the rebuild. Anyone have any suggestions? local guy to you would be FARLER PERFORMANCE. or you could swing up here to Centerville which is about 20 minutes north for you and take to P3 Automotive. Good luck with which way you go with it. Is this your 1st Porsche and are you new to the area? you should join the OVR/PCA they will get you in the look as to local shops and events.. I think this is Farler's busy season right now. I think his "schedule" is prioritized by how much you're spending on your car and how soon the next event for you is. Tell him Eric up there sent you though and there's a much better chance you'll get in, they're pretty good friends. He'll answer your question about where to go in Cincy to get your Alt re-built I'm sure... He's answered my questions before I know. He's located off S.R. 122, East of I-75 (East of Middletown). I go to Steve Mains at The Sports Car Store over by Turfway Downs often. He's done good work for me and could hook you up too. Do you have Wayne's (101 Projects for the P-911) book ? I think that one's in there. You can pick it up anywhere... I bet you can do it if you're half-way decent around cars. If it is over charging, it is an easy fix once you have it out of the car. The regulator is external. If you are new to Porsches, document your proceedure with a video camera or digital camera, that way you can review which wire goes where, etc. or post pictures here so we can see what you need help on. There's nothing magic about our alternators. Any competent shop that rebuilds foreign alternators can do the work. I had mine redone several years ago by a local shop for about $75, and it's still going strong. '87 has an INTERNAL regulator not external. It probably takes five minutes to change the regulator. If you are convinced that is the problem you can probably save yourself a few hundred dollars and a few hours of time by DIY. That would be a negative John. The '87 ('84-'89) has an EXTERNAL Voltage Regulator. It sits on the back side of the alternator housing. You are correct about the location of the regulator, but incorrect about what we call it. An external voltage regulator was used on 911's from 1964 to 1981. It is identifiable by a metal can mounted on the engine electrical console on the left side of the engine compartment. 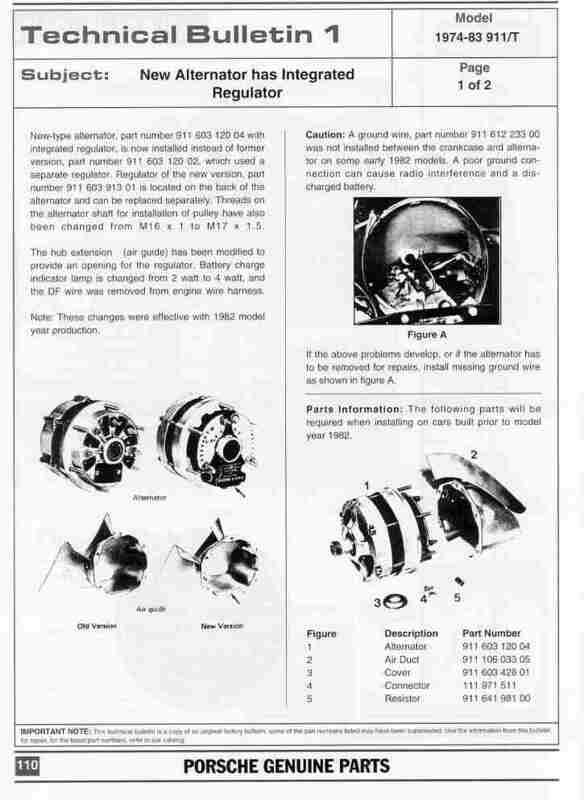 In 1982, the voltage regulator was changed to an internal type, which is mounted in the back of the alternator. It remained there through the introduction of the 964. Here is a Factory technical service bulletin explaining the change. Wow, When they say external they mean external. I always thought the internal one was actually mounted inside the alternator. Thanks for the clarification.